France, 2001, 86 minutes, Colour. Anais Reboux, Roxane Mesquida, Libero de Rienzo, Arsinee Khanjian, Laura Betti. 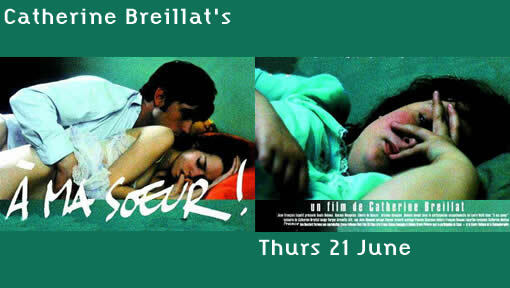 Catherine Breillat is a director and writer who generally pulls no punches, especially in her explorations of human sexuality. This was very true for her films of the 1990s including Romance. It was particularly true of her 2003 film, The Anatomy of Hell, which seemed to go beyond bounds. However, while there was criticism of A Ma Souer, it is a much more accessible film, has stronger characters and explores themes interestingly. The focus is on two teenage sisters who are on holidays with their mother. The fifteen-year-old is very pretty while the twelve-year-old is fat and dumpy, always being criticised by her older sister. When the older sister teams up with an attractive Italian student, and has sexual encounters with him, it has deep effects on her as well as on her sister. The film has long sequences of the interactions between the young man and the girl, a critique of his age, of her consent, of the effect of the experience on her for the future, especially as he pretends to be engaged, giving her a ring from his mother (who later comes to claim it back). The final ten minutes of the film are rather shocking, a change of tone with a serial killer attacking the family in a car. He seems to have raped the younger girl – although she comes out of the forest telling the police that she has not been raped. This leaves a question mark in the minds of the audience about the young girl, her attitudes towards life, towards her sister, towards sexuality. Catherine Breillat had a stroke and came back to film-making with An Old Mistress, a version of a 19th century Dangerous Liaison-style story which is quite sumptuous – and less explicit than her previous films. 1.The work of Catherine Breillat? Provocative? Extremes? Themes? Treatment? 2.The French settings, the holiday, the countryside? The house? The open road, the cafés? Authentic and real atmosphere? The musical score? 3.The French title, the older girl and her attitude towards her younger fat sister? The emphasis of the English title on the fat girl herself? 4.The introduction to the two girls, their appearance, Elene and her wanting to be glamorous, thin, criticising Anais? Anais and her having to cope? The criticisms when she ate too much? In her swimming costume at the pool? Their talking with each other, the bond despite the criticism? Their attitude towards their mother, her concern about them – but not particularly present to them? The father, his going on a trip? 5.Fernando, Italian charm, the law student, the encounter with the two girls at the café, his buying them a coffee, his chatting Elene up? The beginnings of a seduction? The meeting, his coming to a meal, meeting the parents? Seeming acceptable? 6.His coming to the room at night, with Anais in the room? The seductive talk, Elene’s response, her not being able to go through fully with the sexual encounter? His reaction? The plausibility of his words, the usual seductive phrases, the deception of the young girl? 7.The aftermath, the two girls discussing the situation, going to the beach, Anais at the beach, the criticism of the other two? 8.The sexual encounter in the room, Anais and her pretending to sleep? The reaction of Elene to Fernando, thinking that this was love? His giving her the ring and the story about the ring? 9.The aftermath, Elene knowing in her heart that he had a lot of girls? Believing she was the only one? His mother’s arrival, demanding the ring back? Her being heartbroken? The support of Anais? 10.The car ride, the music, Anais in the back, the mother and her driving? Stopping for the meal? Stopping at the garage? The shocking violence of the man attacking the car, the killing of Elene? Strangling the mother? Anais getting out of the car, his pursuing her into the woods? 11.Anais coming out of the woods, saying she had not been raped, the freeze-frame on her? Her own attitude towards sexuality, virginity, the film’s theory that the first time should not be with someone someone loves, that this is merely physical and sexual and that the important thing is love? 12.The overall impact of the film? In terms of characters, a French exploration of sexuality?